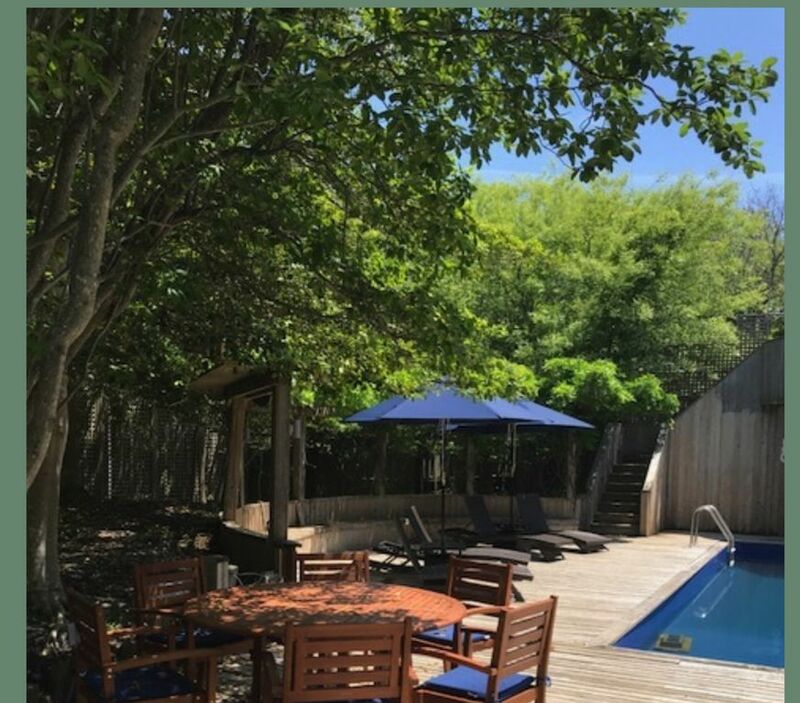 Gorgeous renovated 3 bedroom 3 bath compound in the Fire Island Pines, one block from the Atlantic Ocean and some of the most majestic beaches on the Eastern seaboard. High end brand new kitchen with quartz countertops and stainless appliances. Brand new solar heated inground pool, one of the largest in Fire Island, complete with wet bar and large outdoor shower area. Propane bbq on each level. Wireless two zone surround sound, one for the outdoors and one for the main living area. Three bedrooms, one with king bed and ensuite bath adjacent to pool deck (can be converted to two twin beds), one queen bed with private bath and balcony, and one adjacent to pool deck with queen bed. Extensive grounds, multiple decks and seating areas with a truly private feel. All brand new furnishings are sure to provide you with a high end vacation experience. Desirable east end location with an only 7 minute walk to the harbor where you can enjoy shopping, fine dining and nightlife. Enjoy views of the Great South Bay from the loft. This home will give you the feeling of your own private compound. Rentals are from Thursday at 4 PM through Thursday at 11 AM. Kevin and Tom were great. Any little question got answered immediately and they were focused on making sure our time in their house was stress-free.